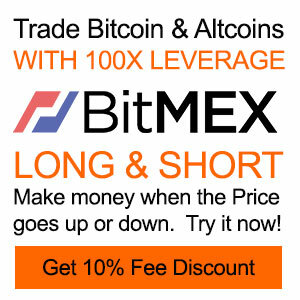 EXMO.com is a bitcoin and other currency exchange company based in Spain and specifically on Calle Bac de Roda 120, local 2 08019 Barcelona. They’ve got an international team consisting of programmers from Spain, Russia, India and Thailand, as well as financial advisors from the UK and the USA, Lithuania and Singapore. Their services have been embraced by the outstanding number of 253,770 customers in well over 100 different countries. Let’s have a look at their pros and cons, analyzing the various aspects of EXMO.com. EXMO.com comes in four different languages, facilitating the user experience a great deal. To be more specific, you can check out their website in English, Spanish, Russian and French. You can benefit from the services of EXMO.com upon signing up and adding your credit card or debit card. There are special fees that come with the use of your Wallet or Trade options, exchanging bitcoins and other currencies and cryptocurrencies. 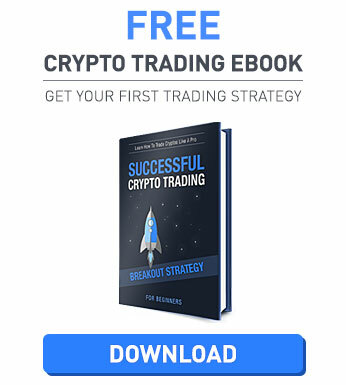 For analytic fees and limits regarding the amount of money you can trade at a time, you can check out their respective section here. Bitcoin, USD, Litecoin, Dogecoin, Peercoin, VertCoin, BC, WhiteCoin, DRK, EUR and RUB are the 11 currencies that can be served from the platform. EXMO.com is based is a Spanish company based in Barcelona. They have been around for over a decade, making them an established option with proven results over time. When it comes to their privacy, they are really detailed as to what data they might collect from you and what they might use such data for. On their website, lastly, they have got a banner, clearly indicating that they are a Bitcoin Foundation member. Their partners also include CoinDesk and BitcoinTalk, InCapsula and ZenDesk (among others). In the field of online security, EXMO has come a long way and can be proud of the results displayed over time. First and foremost, their site is SSL secured. This prevents any attempt to hack the system and make bad use of the services provide by EXMO. Along with that, the 2 factor authentication that is applied to the users of the platform enhances the overall sense of security. Trusted IP and a sophisticated encrypted system in cold wallets complete the protective measures they take against any malicious intent. It is worth repeating the solid Privacy and AML Policies from the company. It is quite easy and simple to start using the services on EXMO.com. Upon navigating to their home page, there is a direct message that urges you to either sign up or sign in. Should you choose the former, you will be redirected to a simple form. In this form, you will be expected to fill in your login and email, as well as your password. Then, you will be prompted to check the box that indicates you have agreed to the policies stated on the website and another box, proving you are not a robot. After that, you will head to your email account and click on the verification code sent over to you. 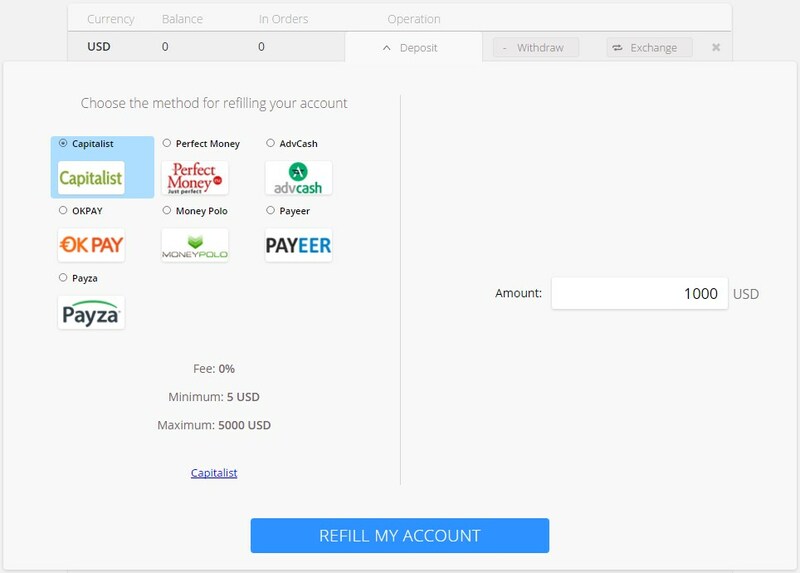 After having completed the sign-up process, you can go ahead with an easy-to-handle interface that allows you to fully control your wallet, trade and exchange currencies. On the home page, there is a chart with the price rates of bitcoins and you can see how the prices have fluctuated over a day, a week, a month or a year. The price is available for the analogies of bitcoins with EUR, USD and RUB. 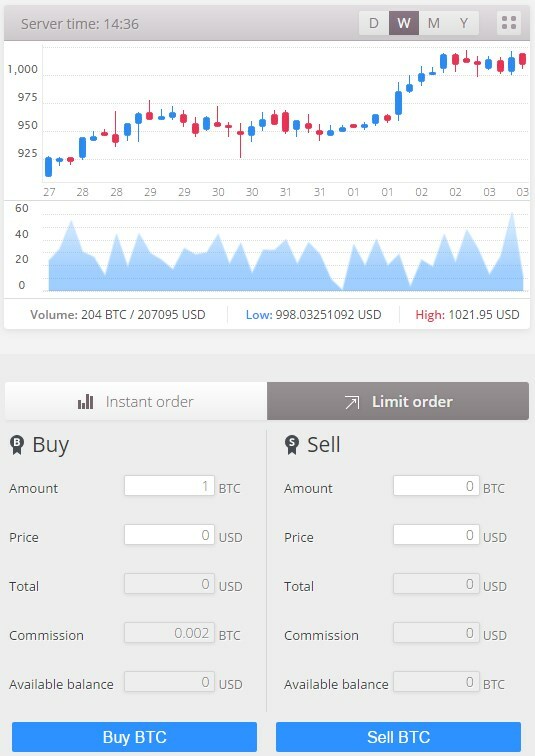 In addition, you can easily have a look at the daily volume of exchange transactions and the number of active users for the day. There is a lot to receive from the support of EXMO.com, which is pretty awesome. Firstly, we cannot help but outline the fact that there is live online chat for you to turn to (in several languages). In order to start chatting, though, you need to present some form of identification (you can use Facebook, Google+ or name and email address). Other than that, you can submit a ticket and wait for their response. Of course, nothing beats live chat in speed. Additionally, there are phone numbers available for each country, where EXMO.com is offered. An email is another alternative way of getting to ask for clarifications and other stuff. Last but not least, there is the knowledgebase with the most frequently asked questions (FAQ) – divided in parts, depending on the topic. Social media platforms are also places where you can find representatives of EXMO, although this is not necessary, given the diversity of support options. We have completed our EXMO.com review and it is time we handed out our verdict. It is needless to say that the overall quality of services provided by EXMO.com is impressive. The navigation and user experience can only be described as smooth and carefree, while there is great support diversity that covers all kinds of needs. The policy regarding AML and privacy matters is solid and reliable, unlike in some other competitors on the market nowadays. Security is taken seriously, with 2 factor authentication and SSL, encryption in the wallets and trades. There is always room for improvement (when it comes to the acceptance of even more payment methods and currencies accepted online, the need for verification of identity prior to chatting and some other minor problems), but as a whole EXMO.com has passed our review with flying colors. Hello I am Grace from South Africa I apreaciate to sign up with Exmo.com and i went through the review,policies, payment methods this is so interesting i hope my to enjoy mmy bitcoin exchange from Bc-prime and many more. horrible service. They lock your withdrawal for 72h for nonsense . During this week 52/2016, I had an issue with Exmo.com. 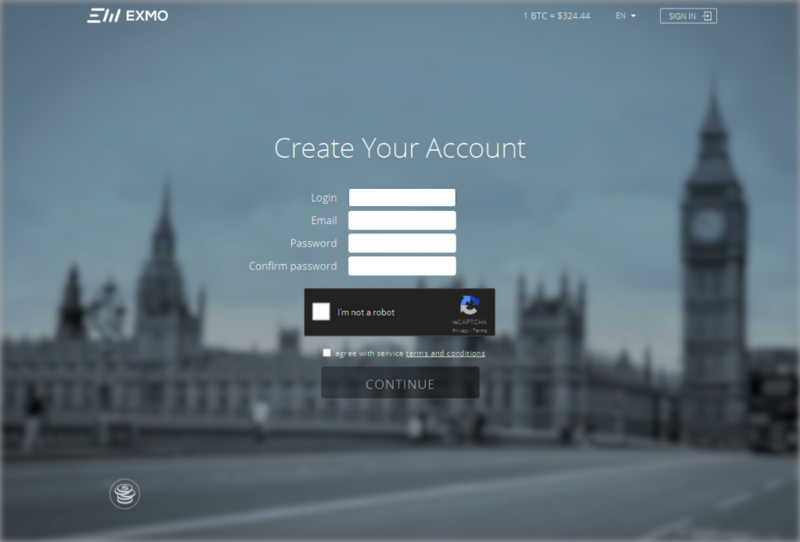 My several bitcoin deposits in Exmo.com was taken and not added up to my account because less than 0.001 BTC. 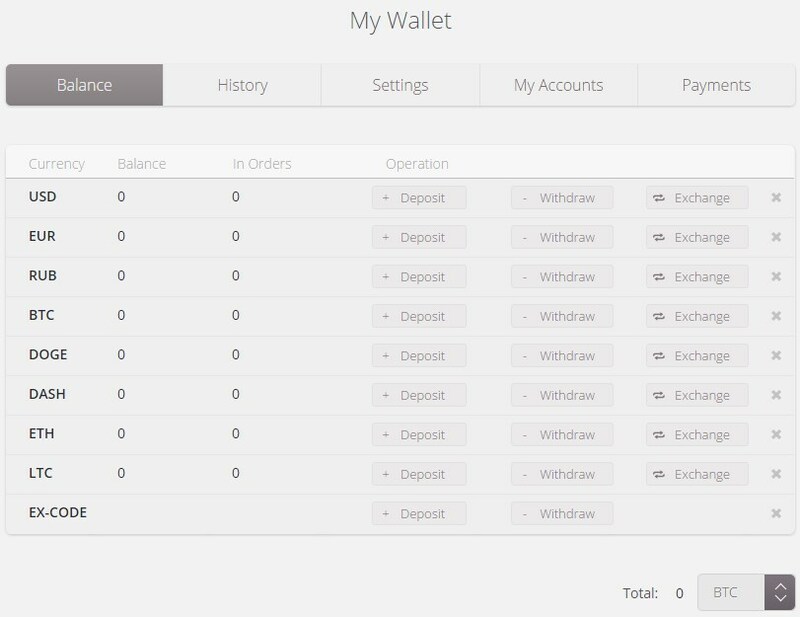 I lost several deposits that at the end totals more than 0.001 BTC. I consider this as an abuse and fraud. Can you please redirect me to the right contact to report such a fraud ? ZEC went from 291 to 409 in 1 hour. What EXMO did? Held every ZED withdraw informing that they had a technical problem. Without a forecast to be solved. 6 hours later and nothing. They can’t handle huge price fluctuations. Besides the mentioned above there is no Warning informing the users that they have a ZEC withdraw problem. You are able to fund your wallet, buy the ZEC and even order a withdraw, but then the withdraw is kept under verification for hours, and only through the online chat, they inform you the problem. There is not a communication channel to follow if the issues was solved. My recommendation: keep your money elsewhere. Do not recommend this exchange! The worst service and support i ever used or see. On date 21-12-2017 I withdrew btc and now twenty days have passed and my btc withdrawal status is paid but I didn’t receive it to my wallet even the btc is not in mempool they are making fool they are using our money for their own use.